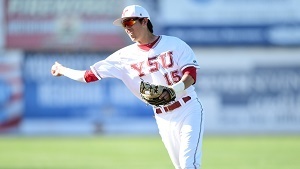 The Youngstown State baseball team held their first practice of fall ball on Monday afternoon at Eastwood Field. The Penguins are incorporating a group of 23 newcomers, which includes 10 transfers and 13 freshmen, to their full roster of 35. The team started the workout with some light running and stretching before conducting various situational base-running drills. The team then moved on to individual drills which featured Head Coach Dan Bertolini working with infielders, Assistant Coach Eric Smith with outfielders and Assistant Coach Ryan Krokos with catchers. After the individual drills, the Penguins focused on multiple double-play scenarios and cut-off assignments on defense. The group then held an individual session focused on holding runners at both first and second base. The practice concluded with a review of pop-fly/fly ball communication before batting practice with Smith. The Penguins will hold their first intrasquad scrimmage on Friday at 2:30 p.m. to begin a busy weekend for the program. YSU will host an alumni game at 6 p.m., and the program’s golf outing will be Saturday at 1 p.m. at Youngstown Country Club. Juniors (12): Kyle Benyo, Austin Butler, Nick Caruso, Web Charles, Kip DeShields, Drew Dickerson, Collin Floyd, Joel Hake, Zach Lopatka, Nick Massey, Zack Minney, Cameron Murray.